Ships have been sailing from Seattle to Alaska since the gold rush. Now it’s your turn to follow in the wake of history on a seven-day cruise vacation filled with glacier-carved fjords, forested islets and quaint ports along Alaska’s famed Inside Passage. These are serene waters, where one moment you can be sailing a wide bay of barrier islands and the next you’re cruising through a narrow waterway flanked by towering forested walls. That’s the splendid spectacle of the Inside Passage — the scenery is constantly changing, from picturesque shores to friendly coastal towns. 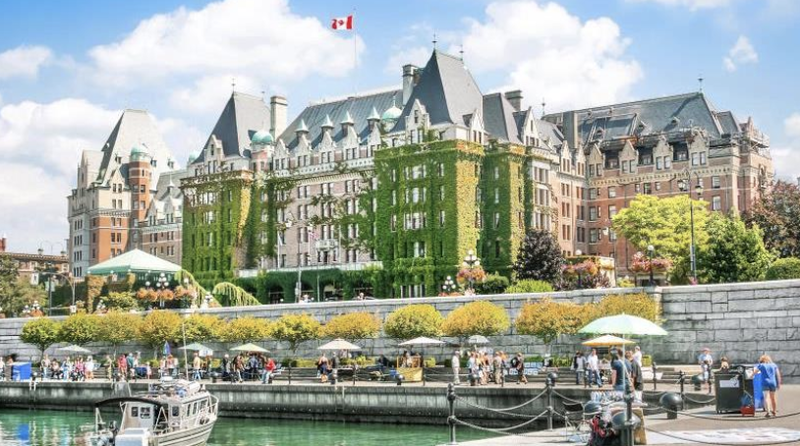 Stretching from Puget Sound, Washington, through the British Columbia coast and into the Gulf of Alaska, the Inside Passage includes more than 1,000 islands, seemingly endless shore line and thousands of idyllic coves and bays. Sailing with Princess from Seattle, you’ll marvel at the breathtaking scenery and encounter ports like Gold Rush-era Skagway and Ketchikan, the capital city of Juneau and British-flavored Victoria. These are places where you can visit a Native village, learn about the triumphs and tragedies of Alaska’s Gold Rush heyday or go dog sledding with a real musher. The Inside Passage has stories to tell that will give you a greater understanding of the culture, history and lifestyle of the Great Land. You'll depart from Columbus, OH and fly to Seattle, arriving the day before the cruise. 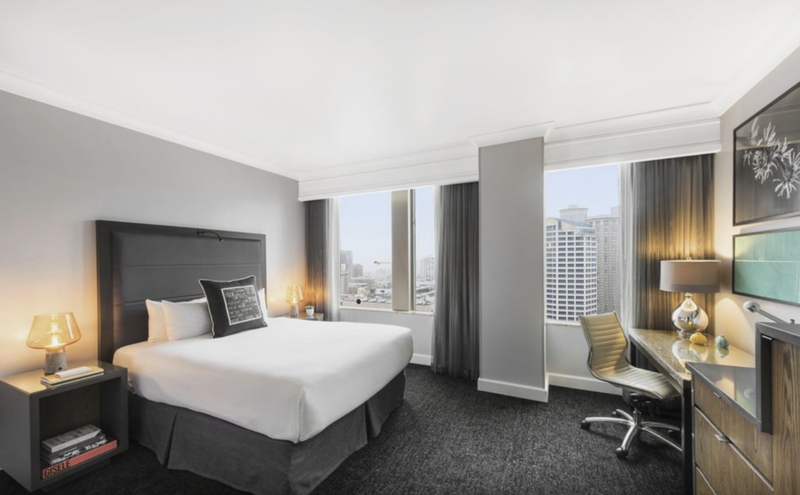 You'll arrive in Seattle today and check into your centrally located hotel room. Many popular sites and great restaurants are within walking distance or a short taxi ride. Enjoy the city! Included in your itinerary is access to the famed Seattle Space Needle and the attached Chihuly Garden. This evening, enjoy a baseball game at Safeco Field watching the Seattle Mariners take on the NY Yankees (extra cost). Visit the iconic Space Needle and world-famous Chihuly Garden and Glass on this combo ticket. Make your way to the top of the 520 ft. observation deck for unparalleled views of downtown Seattle, Mt. Rainier, and the Puget Sound while zooming in on the action through high-quality Swarovski telescopes. Walk through the blown-glass art exhibit of Washington native Dale Chihuly and see the world-famous glass chandeliers and Native American-inspired art he created after working at a glass factory in Venice. Book together to experience the scenic beauty of Seattle viewed up high and the unique artistic offerings of the Emerald City in one visit. Built for the 1962 World’s Fair, the 605-foot tall (184 meters) Space Needle is an integral part of the Seattle skyline and the landmark of the city with over one million visitors making their way to the top each year. Now it’s your turn to experience it for yourself! After redeeming your ticket at the bottom of the Space Needle admissions, take a 41-second elevator ride to the top for a stunning panorama view of the sprawling city cradled between the Puget Sound and rolling hills to the East. The imposing, glacier-capped Mt. Rainier will loom large before you while distant views of the Olympic and Cascade Mountain ranges retreat towards to the horizon. Look through high-powered telescopes to catch a closer view of the action or head inside to the revolving Sky City Restaurant to fortify yourself with brunch, lunch, or dinner to get through the rest of the day. After feasting on delicious local fare and 360 degree views of the city, head down the elevator to Chihuly Garden and Glass just beneath the Space Needle As one of the most prolific glass artists of the 20th century, Dale Chihuly pushed the boundaries of blown glass as an art medium and gained world-renown recognition for his Native American and nature-inspired art. Make your way through the wonderland of 8 unique Galleries, the 40-foot-tall Glasshouse filled with 4,500 square feet of light and color, and snap photos of towering sculptures while strolling through the lush, ever-changing seasonal Gardens. The combo ticket allows you to visit two of Seattle’s most popular attractions for one discounted price. Take in the sweeping views of the Pacific Northwest, eat at Seattle’s highest cafe and restaurant, and walk through the red, orange, and yellow tinged light of the famed Chihuly Garden and Glass with one convenient ticket. Both attractions must be visited in the same day. Rick and Abbie! You have 2 tickets to go see this game! Today you'll embark on your journey to experience incredible history, famous landmarks and unique culture in grand style! Make sure to be at the cruise port (Pier 91) early with plenty of time to spare (we suggest arriving around noon). 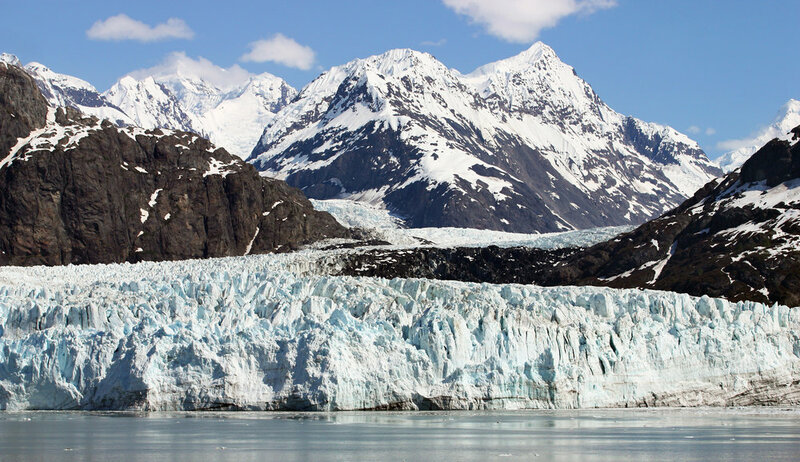 Included in your package is the whale watching and Mendenhall Glacier tour. On the way to Mendenhall Glacier, you will learn about the history and trivia of this famous state capital. Your guide will be on hand to provide narration once you arrive to the awe inspiring Mendenhall Glacier. An hour visit will ensure enough time for overlook point, take pictures and spend time at the Visitor's Center. Afterwards, you will board your boat with your guide and naturalist to view the famous residents of the area. During the course of your trip, you will learn about life in Alaska as well as the habits of these mammals. In addition to humpbacks, you are also likely to see orca whales, stellar sea lions, harbor seals and eagles. Included in your package is the White Pass Train and drive. Once a water-stop for the thirsty steam engines and rotary snowplows, Fraser, BC, is now the site of Canadian Customs and Immigration. Upon arrival at the train depot in Fraser, you'll be transferred to a comfortable tour vehicle for your return trip to Skagway while being entertained by professional guides with their amusing stories of local lore and captivating tales of the Gold Rush Era. As you drive down the mountainside, you'll have ample opportunities to take fabulous photos at scenic vistas such as Skagway Scenic Overlook, Pitchfork Falls, Bridal Veil Falls, and more. Since this excursion enters Canada, all passengers must bring their passport or passport card. 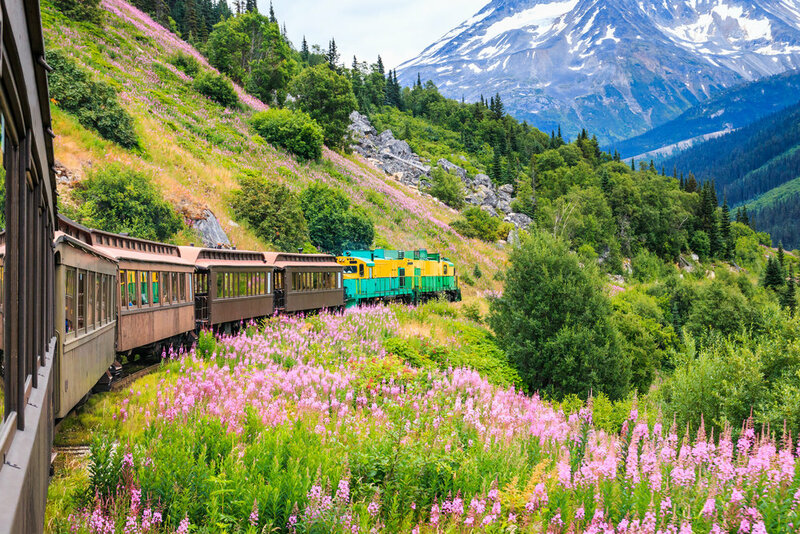 Built in 1898 during the Klondike Gold Rush, the Scenic Railway of the World was designated as an International Historic Civil Engineering Landmark (along with the Eiffel Tower and Statue of Liberty). The 3-foot wide Narrow Gauge Railroad climbs almost 3,000 feet in the first 20 miles with an average grade of 2.6%, and up to 3.9% in some locations. It also passes through two tunnels and travels over sky high trestles and bridges. Comfortable restored and replica passenger coaches are pulled by vintage diesel locomotives. Each heated passenger coach has large viewing windows and a restroom. 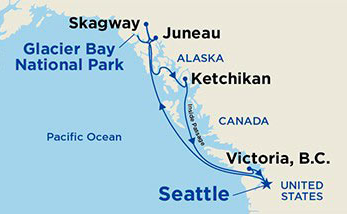 Included in your package is the Ketchikan city tour and Totem Bight tour. This trip will take you to the outskirts of Ketchikan, as Totem Bight is a lovely 15 minutes from downtown. It was originally the site of a traditional fishing camp and has proven to be a peaceful spot on the edge of Tongass Narrows. The short walk through the woods to the location of the totems provides both an aesthetic and educational experience. Your transfer to the airport will pick you up at the cruise port for your flight home, today! Cancellation in writing must be received by Zone Travel prior to departure for appropriate refund on the land/sea tour cost minus the following fees. Airline penalties are not part of the percentages below and vary based on each individual airline policy. You are required to pay a cancellation fee (including 3rd and 4th berths) if You cancel Your Cruise, Cruisetour or Cruise Plus package. Cancellation fees are based on the fare paid, excluding Taxes, Fees and Port Expenses, transfers, , surcharges, shore & land excursions and most pre-purchased gift(s) and/or special service(s). You are not entitled to any refund, payment, compensation or credit except as otherwise provided in this Section. Any refunds will be made directly to the method of payment You used at the time of booking or Your travel agent and You must receive Your refund directly from these sources. You may cancel by telephone or electronic advice via a Carrier-approved Computer Reservation System, provided Carrier immediately receives written confirmation of cancellation. In such case cancellation shall be deemed effective as of the close of business Pacific Standard Time on the date You communicated such cancellation. Since a cancellation likely means a diminished opportunity to sell space on other cruises/cruisetours, the cancellation fees in the schedules below apply regardless of whether Your space is resold. You hereby agree that losses sustained by us in the event of Your cancellation would be very difficult or impossible to quantify, and that the fees set forth in our cancellation policy represent a fair and reasonable assessment as liquidated damages. The amount of cancellation fee varies based on length of sailing for cruise/cruisetour and timing of cancellation for cruise/cruisetour and Cruise Plus package, as illustrated in the schedules below. *Items: Cruise, Cruisetour, Cruise Plus Package, pre-purchased gift(s)/special services. *For those passengers booking a reduced deposit promotion, the initial cancellation fee amount will not exceed the deposit required/paid. What is included in my cruise? As the Consummate Host, Princess Cruises strives to provide each guest with a truly unforgettable onboard experience and an exceptional value for their vacation dollar. From an array of great-tasting dining options to engaging onboard activities to staterooms featuring all the comforts of home, you’ll discover plenty of amazing options that are included in your cruise fare, so you can simply relax, unwind and escape completely. Facilities vary between ships so make sure you check the “Ships” pages in the “Learn About our Cruises” section of princess.com to discover the options available on your chosen cruise. Taste your way through an ever-changing menu of delicious options for breakfast, lunch and dinner in our main dining rooms, with your choice of Anytime or Traditional Dining in the evening. Choose from an array of casual dining venues to satisfy any craving, including: fresh pastries and paninis at the International Café; crisp salads, hearty soups and warm rolls baked three times daily in the Horizon Court buffet; grilled hamburgers, hot dogs and hand-tossed Neapolitan-style pizza in our convenient poolside grill and pizzeria. Order from a room service menu at any time of day or night. Indulge in a hearty British-style Pub Lunch in the Wheelhouse Bar or alternate location during sea days. Treat yourself to creamy, refreshing soft-serve ice cream – sprinkles optional – every day. Delight in chilled glasses of milk and warm cookies just out of the oven, served every afternoon. Enjoy Princess Signature Shows with lively music, stunning choreography and some of the largest casts at sea. Cozy up under a fleece blanket with complimentary popcorn as you watch anything from Hollywood blockbusters to live sports events and concerts on the giant poolside screens at Movies Under the Stars®. Melt into your chair and relax in the inviting Piazza-style Atrium while street performers and musicians entertain you. Applaud the comedy, live music and cabaret of talented guest entertainers, dance in the night club or sing your favorite tune during our Princess Pop Star competition. Let loose at Princess deck parties with festive themes that go till late at night. Flip through a wide choice of satellite channels or relax with a Hollywood blockbuster film on your stateroom television (subject to reception). Peruse the extensive onboard library with over 2,000 books. Check out our incredible Youth & Teen program with fun age-specific activities from science experiments to arts & crafts to video games, makeovers and teen dance parties. Practice your skills with a variety of sports activities including table tennis, basketball and a jogging track. Stay fit in the well-equipped Lotus Spa® Fitness Center, complete with treadmills, rowing machines, exercise bikes, and free weights. Relax and take a dip in our many fresh water pools, including some underneath a retractable glass dome to enjoy rain or shine, as well as swim-against-the-current pools and soothing whirlpool spas. Discover the friendly services of your stateroom steward, whether you’ve chosen a modest inside stateroom or a luxurious suite. Enjoy the conveniences of home, including a TV, hairdryer, refrigerator, in-room safe, bathroom sundries, and more – in every stateroom! Rest your weary eyes upon comfortable beds blanketed in duvets with 100% Egyptian cotton bed linens. Taxes, Fees & Port Expenses as shown on your booking confirmation are included in your cruise fare. Other items are not included in the cruise fare including, but not limited to: gratuities for onboard staff, alcoholic and some non-alcoholic drinks, spa and salon services, laundry, shore excursions, travel insurance, purchases made in the onboard stores, or meals at hotels when booking pre- or post-cruise hotel stays or cruisetours. The Boarding Pass provides information required at embarkation. There are two types of Boarding Passes: Regular and Preferred. Printing your boarding pass and luggage tags is fast and easy! Beginning 75 days prior to sailing, you can print your boarding pass and luggage tags once the booking is paid in full and we’ve been provided with all your guest immigration information and credit card registration. Simply log-in to Cruise Personalizer® to access and print this information! Can I prepay my gratuities? YES! For your convenience, we're pleased to offer you the ability to pre-pay the gratuity that is included in your folio onboard at the end of your cruise. You can also utilize this service as a gift for someone else who may be cruising. The gratuity amount is based on the itinerary length. It is $15.50 per guest for suites, $14.50 per guest for mini-suites and club class, and $13.50 per guest for interior, oceanview, and balcony staterooms. To take advantage of this service, login to Cruise Personalizer to pre-pay online, or simply call 1-855-500-7690 and reference Special Service Item #0591. Pre-payment is available up to 2 days prior to departure. Can I prepay for a beverage package? Pre-paying beverage packages and cellars offer a great way to save time at embarkation. From a bottle of wine to beer specials to our Premier Beverage Package* option that features cocktails, fountain sodas and bottled water, there's a beverage package to quench every thirst. To take advantage of pre-payment, login to Cruise Personalizer to pre-pay online, or simply call 1-855-500-7690. Pre-payment is available up to 3 days prior to departure. *Please note: Beverage Packages are calculated based on the total number of days of your cruise. Premier Beverage Package does not include bottles of wine; however, when purchased in the bars or dining rooms, will be available at a 25% discount from the menu price. Package is NOT available for purchase within 3 days of sailing and is NOT available for voyages 2 nights or fewer. Package must be purchased for full length of voyage, cannot be shared, is non-transferable, and is non-refundable within 3 days of sailing. Alcoholic drinks are limited to 15 beverages per 24 hour period (non-alcoholic beverages do not have this limitation). What does the Premier Beverage package include? Unlimited non-alcoholic beverages (such as soda, juice, espresso, coffee, tea) and alcoholic beverages under $12 (liquor, beer, glasses of wine). There is a max of 15 alcoholic beverages per 24 hour period. To order your formal wear, please visit cruiselineformal.com, call 800-551-5091 or 305-252-8572. For questions, email: custservice@cruiselineformal.com. *Zone Travel LLC and Princess Cruises is not responsible for any alcoholic beverages removed and discarded by shoreside security staff. Such items are not eligible for monetary refund or replacement. How safe are my valuables? Zone Travel LLC is not responsible for lost or stolen items. We strongly recommend you hand-carry all valuables and breakables, including jewelry, electronics and cameras as well as any medications. Please read Princess Cruise's Passage Contract for limitations and responsibilities for lost items and baggage. Scooters (only permitted if used for mobility), boats/canoes/kayaks, Segways, Heely Shoes, Hoverboards/self-balancing scooters. The above list is not exhaustive. The Ship Security Officer and Staff Captain are authorized to make a professional judgement as to the legality of any item, declared, detected or discovered. Traditional Dining is the classic cruise dining experience. Indulge in our freshly-prepared, award-winning cuisine, served at set times in an elegant dining room with the same waitstaff and table mates each evening. Should you need to change this request, call your travel agent no later than three weeks before you sail. Requests for preferences and changes are considered on a first-come, first-served basis. It is not always possible to alter dining preferences or seating arrangements once they are reserved. Once onboard and subject to availability, you may attempt to switch preferences with 24 hours notice to the Maitre D’. We will do our best to accommodate your preference. Dining Hours are posted onboard and are subject to change. Actual times may vary based on itinerary per season. When a casual mood calls, you have plenty of choices – even on formal nights. Whether it be the buffet at the Horizon Court, the pizzeria, burger & hot dog grill, or 24-hour room service, you’re able to choose how you dine with us. Experience the first New Orleans-style restaurant at sea, and enjoy fabulous Creole and Cajun traditional cuisine, such as jambalaya, etouffee and crawfish gumbo. Crown Grill entertains guests with an open, theater-style kitchen where chefs custom-prepare steamed shellfish - such as lobster, scallops, clams and mussels - and cooked-to-order steaks and chops. Experience a more refined approach to the traditional steakhouse. Enjoy the best, most tender cuts of beef, such as New York steak and porterhouse, plus a prime-rib carving station. Specialty restaurants vary on a ship basis. Yes! Guests may call for personal complimentary Room Service at any time of the day or night. To have continental breakfast delivered to the stateroom, fill out the breakfast card included in the stateroom portfolio (one is also placed on the pillow) and hang it out at night on the stateroom door in order to receive delivery the next morning at the time of your choosing. For a full stateroom menu, guests may review the stateroom portfolio, call the number listed in the telephone directory or press the "Room Service" button on their phone. Below are some examples of what's offered on the complimentary Room Service Menu. Please note that Coffee, Iced Tea and Milk are available 24 hours a day. Sandwiches (served with your choice of french fries, potato chips or coleslaw). Princess is happy to meet your request for low-sodium, low-fat, low-sugar and vegetarian diets. Visit Cruise Personalizer® to indicate your dietary preferences. You or your travel consultant must advise Princess in writing of any special diet, allergies or medical needs. Requests must be received no later than 35 days prior to departure for cruises to Alaska, Canada/New England, Caribbean, Hawaii, Mexico, Panama Canal and Coastal Getaways. For all other cruises, requests must be received no later than 65 days prior to departure. Once onboard, please check with the Maitre D' to confirm your request. Any special dining requests (name brands, daily food order requests, sample menus, etc.) not related to medical or allergy requirements should be directed to the onboard dining staff and is not handled by our Dietary Office. What should I expect at Disembarkation? On the majority of Princess cruises, you will be required to identify and clear your luggage through customs. As you leave the ship, you will be directed by Princess representatives to the luggage claim area. As many bags are similar in appearance, please check each luggage tag to ensure you are claiming your own luggage. Due to U.S. and local customs restrictions, guests may not leave the ship until all luggage is off-loaded. With this in mind, we suggest that you relax in one of the many public lounges to wait for customs clearance and disembarkation by pre-designated groups. Customs and immigration inspectors will review with you the customs declarations form upon which you have listed all the articles bought in foreign ports or in the ship's boutiques. 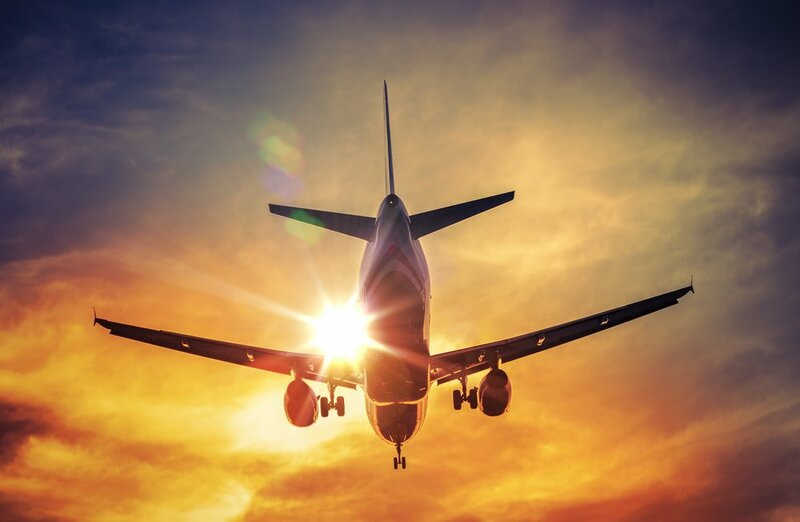 U.S. residents returning to the United States are allowed a duty-free exemption of $800 USD per person, which includes the cost of one liter of alcoholic beverages (if purchased onboard or ashore) for each guest 21 years of age or older. It is recommended that guests keep their sales receipts handy for declaring their purchases. Food items should not be brought into U.S. ports. Please note that family members, who live in the same home and return together in the United States, may combine their standard personal exemptions. Children are allowed the same as adults, with the exception of alcohol and cigarettes. Please note that these are current exemptions and are subject to change. For further customs information, we recommend that you attend the Cruise Director's disembarkation talk given during the last days of the cruise. If your friends or relatives are meeting you at the pier, please be advised that disembarkation may take up to four hours after the scheduled arrival of the ship in order to clear immigration and customs. Princess Cruise Line also requires payment of a fixed service charge for all guests in all categories booked. The charge is per person, per day and can either be pre-paid with the reservation, or charged to the guests onboard account once onboard.There is no charge for children under the age of three. Our crew is encouraged to work together as a service team and compensated by a combination of salary and incentive programs that the service charge supports. It is our earnest wish that you enjoy your cruise experience and that our entire crew in all areas of the ship will provide you with the standard of service for which Norwegian is known. Therefore, if you have any concerns about the service you receive during your cruise; please bring them to the immediate attention of our reception desk staff on board so that we can address any issues in a timely manner before the cruise is over. Princess has a structured guest satisfaction program on board designed to handle any concerns raised by our guests relating to the service or on board product quickly and efficiently. In almost all cases we are able to come up with a satisfactory solution to any issues which are raised and make sure our guests can focus on enjoying their cruise vacation. In the unlikely event we cannot satisfactorily resolve the issues through our guest satisfaction program; guest will be able to adjust the service charge according to the level of inconvenience they feel they have experienced. Our clear priority is to have the opportunity of resolving the issue, when it happens, to everyone’s complete satisfaction.